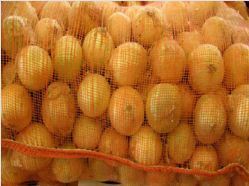 Leno bags which are used for packing fresh vegetables, fruits, potatoes, onions, etc. They are specially woven and designed to maintain freshness of the packed goods by allowing air inside the bags to prevent inner moisture that may spoil the goods. These are UV-stabilized and made according to the customers desired specification and colours. These are available in 5 kg. up to 20 kg. capacity, with or without tie string. Patsons Exports has developed solutions that address the need for proper handling and packaging of perishable items like onions and potatoes, ginger, tomatoes, carrots, coconuts, apples, and other vegetables and fruits. This is being well appreciated not only by growers or consumers but also by the various merchandising associations, traders and authorities involved in marketing of agricultural produce. PATSONS EXPORTS (INDIA) is one of the distinguished manufacturers and exporters of Multicolour PP woven bag & fabrics all across the world for more than a decade. Our factory which is located in the outskirts of Vadodara has been installed with one of the most advanced machinery. Due to our impeccable track record of manufacturing a large variety of quality products, we have carved a niche space for ourselves in the PP woven bags & fabric market. Our vision is to become the most respected solution provider for all plastic packaging needs in the global market, driven by market externally and people internally. We are inspired on day to day basis by our mission to continuously enhance the quality of our products and provide value to our clients. We invest into new technology to produce world class bags and provide them at competitive prices. Therefore, our reach extends to countries like Singapore, Ireland, UK, USA, Mozambique, Zimbabwe, Tanzania, Zambia, Kenya, South Africa, Sudan, Saudi Arabia etc.